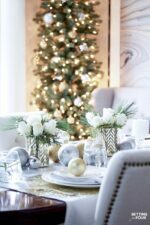 See these elegant table setting ideas for the holidays including festive dinnerware and centerpiece ideas! 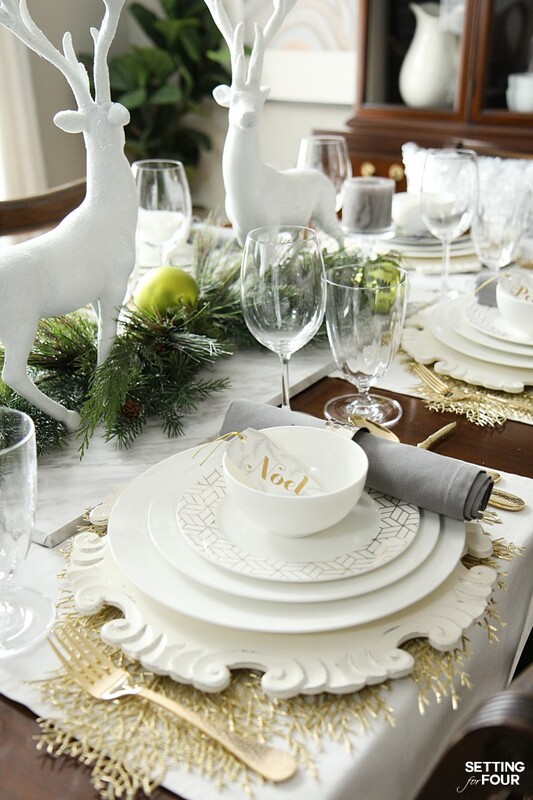 If you saw my Holiday Chic Centerpiece Idea with my sparkly white deer and greenery – you saw a sneak peak of my new Mikasa Lucerne White dinnerware! I am in LOVE with this stunning bone china Lucerne White pattern – it’s a lovely white color and has a very simple clean look….so I can mix and match it with my other dinnerware and with patterned accent plates! This simple pattern and white color is perfect for everyday and for any dinner party. Plus its dishwasher and microwave safe! They are also dishwasher and microwave safe – so convenient! These white fruit bowls also came with the Lucerne dinnerware set – I love the shape of them! Click on any picture below to be taken directly to the product you are interested in learning more about! My Holiday Chic table also got a dose of bling with these sparkling crystal wine glasses and curvy shaped crystal iced beverage glasses! There is nothing like the twinkle of crystal glasses at a set table don’t you think?! Bonus – these are dishwasher safe too. And the star of my table setting is the chic hammered gold flatware set! Be still my heart! 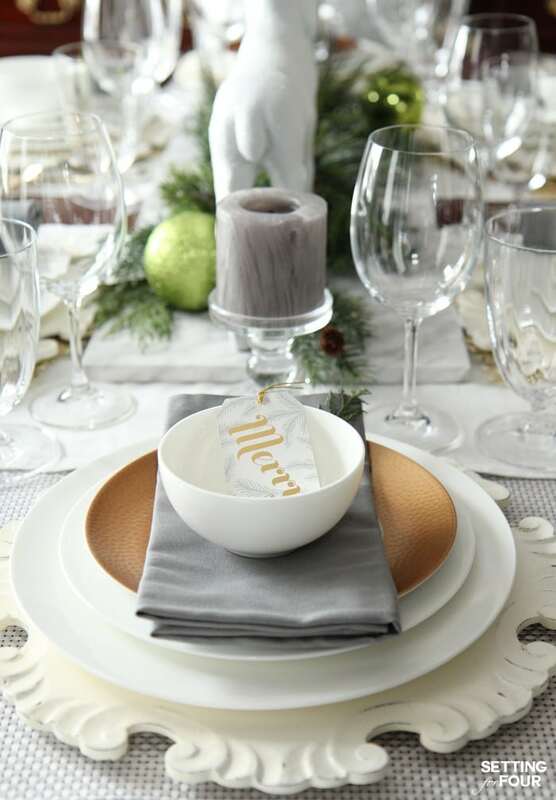 I added pretty gold and gray holiday gift tags at each place setting – I wrote the person’s name on the back of them. I love the festive holiday words like Merry, Noel, Peace and Love! 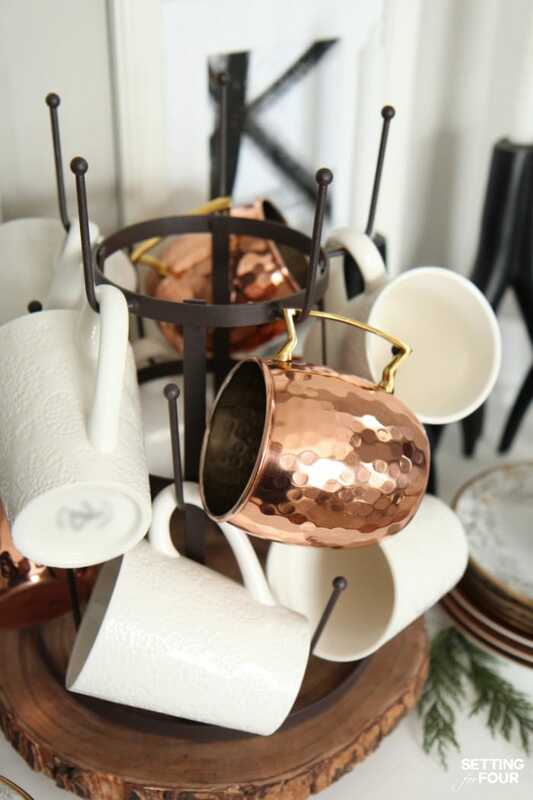 …and here are my new Mikasa hammered copper Moscow mule mugs! I love the pretty hammered finish! I display them on this mug rack in my dining room so they are handy for after dinner drinks! 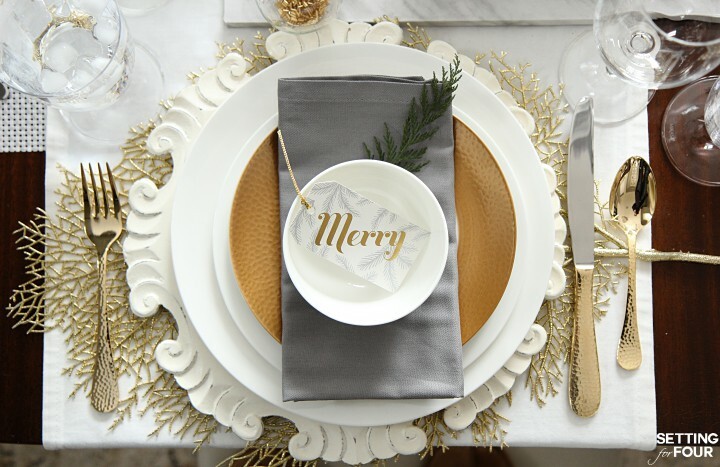 I hope you like my Holiday Chic place setting and how I mixed white plates with touches of gold for an elegant holiday look! Click on any link below to be taken directly to the product you are interested in learning more about! 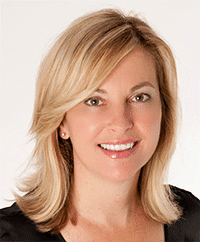 Hi Heather–I love this table setting, and the china choices for the winner. In the spirit of giving this holiday season, I would donate any prize I might win to a worthy family or single. Helping someone nearby is my way of sharing my blessings. Cheers for a happy, healthy success filled 2017. Wow – what a beautiful and thoughtful idea Marilyn!! Thank you for entering and Happy Holidays! I could mix and match with some mikasa pieces I already own and update my white ironstone dishes I’ve had for almost 40 years (not kidding). Your table setting is very elegant. Thanks for the opportunity to enter your draw. This table setting is one of my dreams! It is absolutely stunning! Love, love your table setting! I always loved Mikasa dinnerware. Thanks for a chance to win! The set is a great size for our family of four and would look amazing on our Christmas table! Love your table, too, especially the “glam”!! I would like to incorporate more gold into my place settings. Thank you. 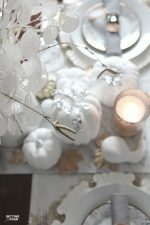 The table setting is gorgeous, love that you can make the simplest tableware into such elegant pieces. Thanks for the giveaways! I am in dire need of a new table-scape. My dishes are about 12 years old now and they look it! 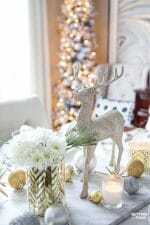 I would love to freshen up my table for the holidays. Your table is gorgeous!! And those hammered flatware pieces……love!!! Winning a set would be my first “fancy” dinnerware and for my first home. Btw your table setting is absolutely beautiful. Such an elegant display. Wonderrful choices in dishes. People would be happy sitting at this table. Your table setting is STUNNING!!!! I would love to rock a Mikasa dinnerware set to that I can feel like an adult who actually has matching dinnerware for my family and friends. Recently joined your blog. Love your tablescapes Hope to get many ideas in the future thank you most of my friends don’t bother but love coming to my house to see my table. I have a Mikasa bowl I received when we got married and it is my very favorite! They make beautiful things. Your table setting is simply gorgeous! Oh this would be wonderful! We have lost several pieces to breakage over the years and are hosting Christmas this year which made me realize we need more china and flatware! Mikasa has such beautiful dishes and tableware. I would love to win one of these sets as I’m down to about 4 plates from my old set. This would be a great Christmas present to me! I really enjoyed this post! Everything looked beautiful! Thank you for the chance to win! Simply stunning! Love everything on your table. Beautiful combination of elements! 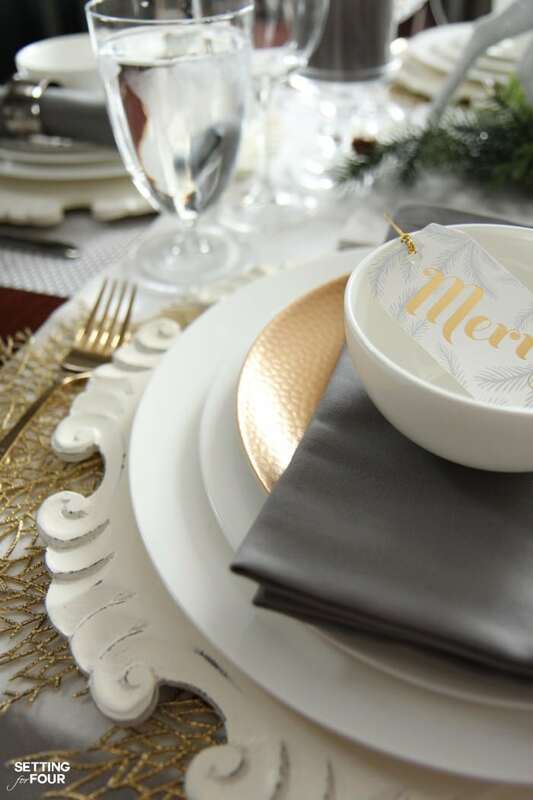 The metallic gold branch placemats add the perfect finishing touch!! How very beautiful! I live the centerpiece. over got the inspiriting, now I just need a table big enough to entertain. Mikasa is not only gorgeous, it’s also a quality product, and that rocks my world! Plus, I can use basic white for any holiday or other occasion. 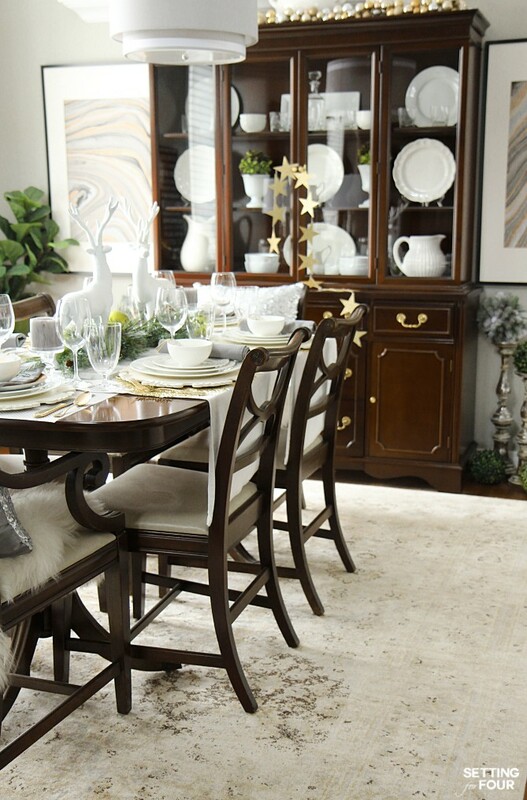 Love your extra festive dining room! This would be perfect for our Christmas day dinner party. I love basic white china! You are so right about being able to mix and match. The gold hammered flat wear is enough to rock my world! Heather your table is stunning! I host a Christmas brunch every year for all of our friends and family that have no place to go for the holidays. This dinnerware would make such a pretty table for them to enjoy! Mikasa Tivoli was my wedding china 35 years ago and I still love it. It would be wonderful to be able to add more Mikasa to our life! I LOVE your sense of style and color! 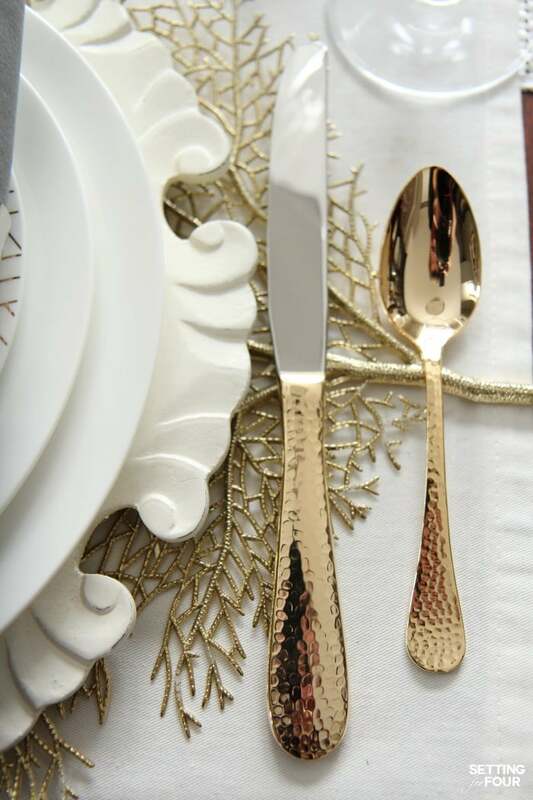 I am absolutely in love with the hammered flatware and gold placemats!! Mikasa is gorgeous and of great quality. Thank you so much for sharing your expertise! I would love new dinnerware. What I have is over forty years and tired looking. Love you table setting.. Thanks for entering Anne Marie and so glad you like my table setting! The table is so glamous and gorgeous! I love all 4 of those Mikasa patterns. Oh my… how to choose! (If I win… my fingers are crossed!). A nice 4-person set would be so great for grown-up nights when it’s just us and my brother and his wife. Often we do this. Thank you for this awesome giveaway opportunity! I love Mikasa china. In January I have three special birthdays, mine, my son, Charlie and my son, William. I love throwing a special dinner for all of us and inviting all our family to join! This dinnerware would be so wonderful to have to celebrate our birthdays! It would rock my world because we need new dishes! It would rock my world, because I’ve always wanted a set of these! Heather, I will be totally honest with you. My current dinnerware set is a garage sale purchase. Considering I entertain all of the time and get positively giddy over the sight of a well-set table, it is kind of hilarious that I’m eating off of plates that used to sit in a dusty box. I love so many of the Mikasa patterns, and that hammered gold flatware!??! Oh, that is stunning! Your table is lovely, lady. Well done! I’ve never had a nice set of dishes so this would really rock my world. The few dishes that I have are old , chipped and do not match! The wooden chargers are to die for! Oh those copper cups!! Well I could go on and on! Just know that I LOVE it all!! This would rock my world because I’ve always wanted a set of of nice dishes but haven’t had the money to do so. Once again you rocked it yourself! It’s amazing that you can dishwash these plates. Yes, my world would be rocked and everyone would be so jelly..haha. Your table is simply stunning! You do such a great job putting things together in such a wonderful way. Winning the Mikasa dinnerware would give me a new tablescape for the holidays!!! I love white plates; they are the rockstar of any table setting. Gorgeous! Gorgeous table setting..Hope i win Happy Holidays!!!! Beautiful! I would love to use these as we just bought our first house and I am looking for new dinnerware! Thanks for entering the giveaway Kenny and congrats on your first home – how exciting!! Happy Holidays! 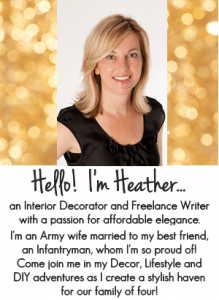 Hi Heather ~ ohhh my goodness, your table setting is absolutely gorgeous. I love every single detail! On your recommendation I ordered the gold leaf placemats and they’re beautiful, even prettier in person! The hammered gold salad plates will really show off a tossed green salad with persimmon slices, pomegranate seeds and blue cheese! They are beautiful. I do love your whole table scape. The white dishes are not limited to any event or holiday. The white deer figures also coordinate perfectly. Mikasa is my fave dinnerware and would replace the set where I broke one plate. Love the Mikasa. The all white dishes allow you to change up everything around them for a whole new look. Gorgeous table!! I love the hammered flatware! I am going to save up for that! I love the Mikasa Gold Dinnerware. That would look beautiful with the dinnerware that I already have that has gold starfish, seahorses, and octopus on them. You can never have too many pretty plates! Thanks for the giveaway! I would love a new dinnerware set to go with our new kitchen. 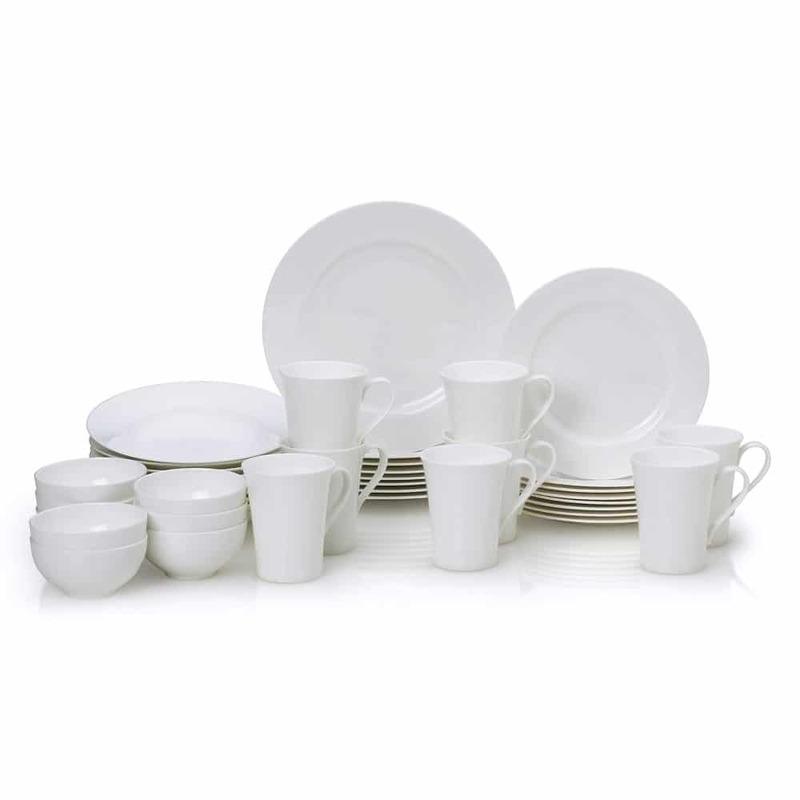 The Aurora Grey 16 Piece Dinnerware Set would be perfect! Wow, this is so pretty – I like that it is simple, classy, and elegant. I want to sit down and eat because I bet the food will be great too! Your table is gorgeous! I would love to add to my collection of china and appreciate the giveaway. Merry Christmas from a retired Army wife. 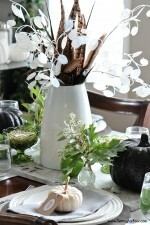 This table scape is perfect for those of us who have neutral color schemes. The China is beautiful. Mikasa makes such beautiful dinnerware! I have two children setting up their own households. It would be so wonderful to share this beautiful dinnerware with one of them! 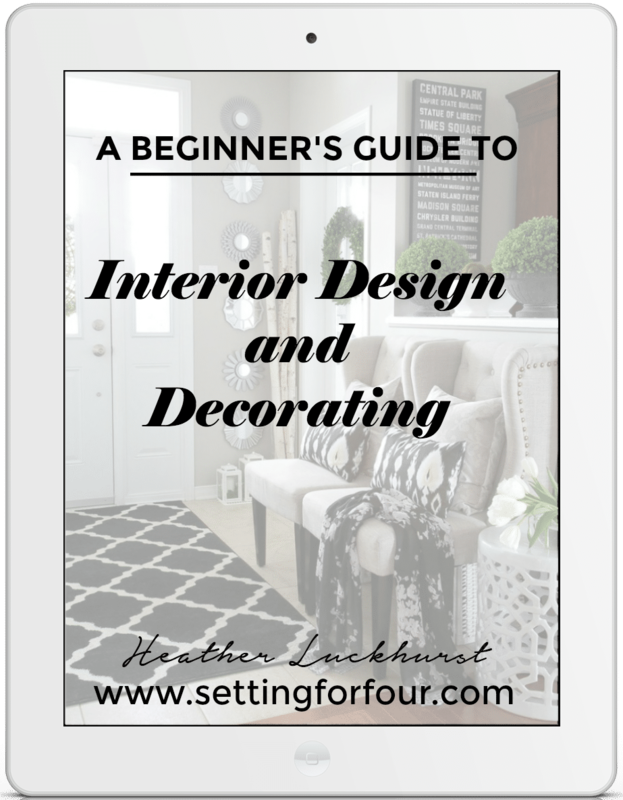 I enjoy reading your blog and inspiring photo’s and would LOVE to win a 4 pce setting of dinnerware. Sign me up!! My nephew is getting married next month on the 7th and if by chance I were to win I would love to give the dinnerware to him and his lovely fiance as a wedding gift. While I could use some new dishes for sure they need them more; these would be perfect. This set would make dinners with my family more fun and help us make our settings prettier. I have no dinnerware set and this would make dinner a formal affair on special occasions. Gorgeous table! I would love a set of all white dishes! They have beautiful designs. I especially love the blue set. It would give me a complete and gorgeous set for the holiday! That would rock my world, for sure! New dinnerware would be amazing! I have had my set for so long and it is all chipped and marked up. Thank you for the chance to win this. I’d love a lovely setting from Mikasa for use as an every day setting that will also function for times when we want something a little more fancy as well. So many lovely patterns to pick from! A Mikasa set would add some flair to my table. My current dish set is plain white Corelle so it’s really boring! It would make my table look so much better when I have guests over. I too love white dishes and white accessories! your tablescape is beautiful. I really like how you tell us where purchase everything. I would love those dishes. Your table looks stunning. I love all the white. It looks so crisp. I love the simple white settings! And that they still look beautiful! I would love to get a beautiful set of dishes for setting out on Christmas Day! I love your chic Christmas table and I know for sure Mikasa makes excellent dishes. Love,love, love the white. You just can’t go wrong with Mikasa! Anyone would be very happy (and lucky) to win!!! I am a dinnerware-aholic and I would just love to win some Mikasa china! How lovely would this be to win! This would so rock my world! Thank you, always enjoy your blog! They’re all beautiful; so hard to choose. Beautiful table!! I really like the blue and white set. Blue is one of my favorite colors. I, too, love to use white when possible! I love your decor! Gorgeous tablescape , my current China is gold. I would love the fancy silver one. It would refresh the look of my table. We need a matching set so badly! My grandbabies have broken a lot of dishes! These are beautiful! I need new dinnerware so badly. I have all boys and they are hard on plates and bowls. I have resorted to paper for them and leave the good stuff for my hubby andI. What a beautiful set! It all goes so well together and the silverware, Oh my!!! If I won I would give it to my daughter who is just starting out and could use a nice set OR lol, she could have my old set and I would select a new set, lol. Merry Christmas!! I don’t have a really nice complete set right now. Having one would rock my world because I could finally host a proper dinner party in my new home. I really loved seeing your table! I was just telling my husband yesterday that I need to do a nice table for the holidays. Yours has given me great inspiration. I love Mikasa dinnerware! 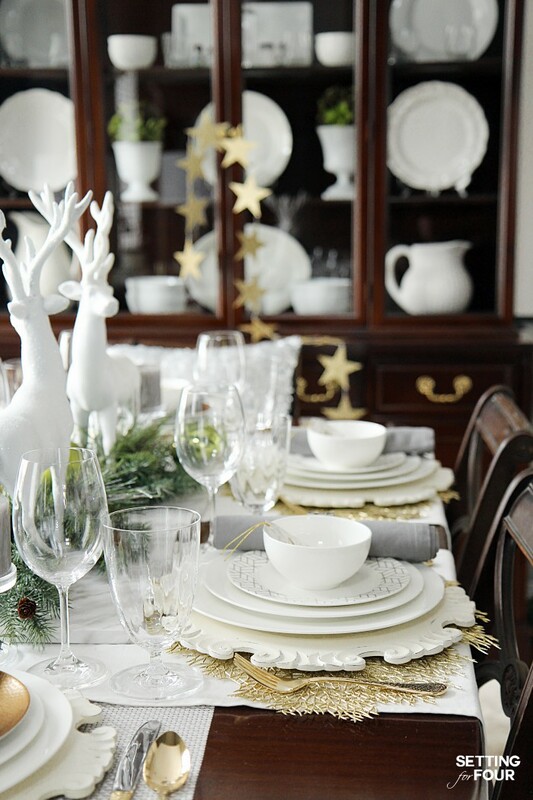 I love the white dinnerware sets as they make everything look so clean and crisp. Mikasa is a brand that stands the test of time. Love your blog! Such beautiful table settings. Mikasa create lovely dishes. I would love to be lucky enough to win these. I first learned about Mikasa when we were stationed in Japan back in 1979 and fell in love with its elegance. Over the years I have picked up different pieces here and there but never any of the dinnerware as I was given a set from family, not Mikasa but it was very nice fine china. I lost that in a move many years ago and do not have a good set of fine China today. I love to entertain and would love to win a set of this beautiful Mikasa fine china. Your table is lovely and by the looks of it, so is your home. I wish everyone a very happy and safe holiday season D good luck to all! Thanks for entering the giveaway Shirley! I sympathize with you losing your china in a move…we’ve lost so many things and had lots damaged in our military moves over the years! It’s frustrating isn’t it? Have a very merry Christmas Shirley! I would so love to win this, I need new dinnerware in the worst way!! Gorgeous photos, Heather! We’ve only ever used mismatched dishes in the 16 years we’ve been married, but now you’re making me reconsider that! 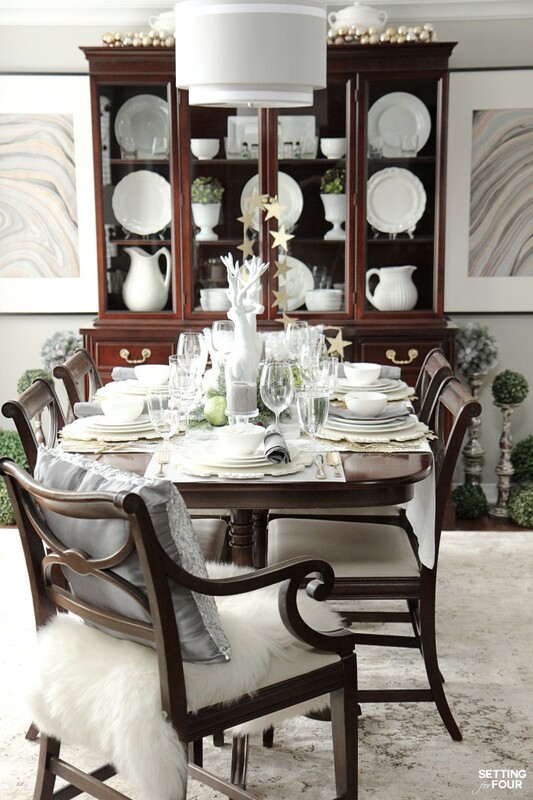 I would love new dinnerware to celebrate special events with my family! It would rock my world because I would finally have a set that matches! I so enjoy having elegant tableware. It takes the dinner to a higher level immediately when you take the time to add some joy to the table. Love your dining room and tablescape! The Mikasa dishes are lovely. I am new to the “world” of entertaining guests, due to my penchant for being a bit anti-social. I don’t really feel comfortable with more than six people at a time…but I like cooking for people (go figure lol). I am trying to get over my anti-social nature in 2017, by hosting a couple of small dinners mixing the younger ladies with the elder ladies of my church. They all have qualities and characteristics that I admire and I wanted to do something simple but personal to show my gratitude to them. I don’t have a nice complete set of dinnerware and these Mikasa offerings are perfection. I adore your simple setting. I’ve been looking at all of the pretty Mikasa patturns (I had never heard of them before!). For my house I like the Woodland Floral. I love Mikasa! Thanks for the opportunity to win! If I were to be selected, I would choose some more festive pieces that I could easily mix-and-match with my current all-white settings for a holiday look! WOW!! The whole setup is absolutely beautiful Heather!!! Goodness would I ever love to have a 16 piece set of dinnerware!! Love your home and table! I could sure use some new dishes and these are lovely! I do like the way that you have used the gold in that tablescape. I need new dinner so this would be fabulous! Gorgeous table setting. Love the hammered gold flatware! We are overdue for new MIKASA dinnerware. Of course, I’ll need new bowls, platters, too. My husband will love having a wish list rather than a wishy-washy, I-don’t-know-what-I-want response from me! I don’t have a nice set of dishes, so I would love to pick one out! I’d replace my old pfaltzgraff! It would be so nice to set a pretty table for a small get together. Just finished telling my sister in law that the reason I have white and gold China is because I can’t commit to a coloured China pattern, but you’ve confirmed for me that it’s because it’s classic and it works every time. Thank you so much Helen! I’m so glad you like my table setting ideas!